1" Cotton Water Bottle Shoulder Strap with Expandable Rubber O-Ring. This product is available in electric blue and burgundy and features the AANP logo in white. This license plate frame will fit over any state license plate and has four universal holes. Support your profession with this 4"x6" oval car magnet. Apply this AANP embroidered iron-on patch to your lab coat. Patch size is 4"L x 2"W.
This Smart Phone Wallet and Stand is made of Simulated Ultrahide Leather. Adhesive attaches directly to the back of most smart phones and cases. Each pocket securely holds up to three credit cards, ID's, driver's license or cash. Say bye-bye to your bulky wallet. Unfolds into a vertical stand to watch videos, monitor alerts, or read messages. Velcro securely holds the panels in place when closed. Your valuables cannot fall out. UltraHide simulated leather has the look and feel of fine napa leather. Available in four colors. 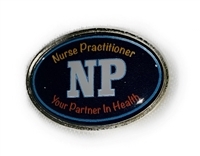 This oval lapel pin features the slogan "Nurse Practitioners Your Partner in Health". With accent colors of gold, this pin is 0.75"H x 1"W with a butterfly backing. This insulated tote features a zippered main compartment, a front pocket and 6" drop handles. A fun way accessory to help support a healthy lifestyle. Available in four colors. Dimensions are 13"L x 4.5"W x 9.5"H.
Identify your luggage more easily! This over-sized round leather tag is a fun accessory for your luggage. Featuring a "NP" debossed on the front of the tag and a clear pocket on the back for you to easily display your business card. Available in seven colors. The Marina Tote Bag features a top zippered closure and 24" cotton handles for added comfort. It has an approximate size of 17 1/2" W x 13" H x 7" D. Available in several eye-catching color choices, this trendy tote is customized with the AANP logo embroidered in beige thread on the front. Spot clean/air dry for best results. An outstanding addition to any space, these great-smelling products are customized with the AANP logo. Your purchase of this beautiful 2019 12-month calendar comprised of pictures around the world by fellow NPs contributes to the AANP International Committee's fundraising efforts. These efforts include providing the opportunity to NPs outside of the US a chance to attend the AANP National Conference! Have the backup power you need with the Charging Essential mobile power set. It includes a mobile power bank and charger cable set in a soft drawstring pouch. The power bank gives you 2,000mAh of backup power and has a matching colored wrist strap, blue charging indicator light and includes a micro USB cable to charge the power bank. The charger cable set includes an integrated carabineer and the plugs you need most often, standard USB, two micro USB and a mini USB. Available in two colors as pictured. Display your certification in this beautiful furniture-grade cherry finish on this hardwood frame. It has a stair-step profile that fades to black on the outer edge. A styrene facing (plexi product) protects the certificate and the back is finished off with a black chipboard backer and sawtooth hanger installed on frame. This soft sherpa blanket is approximately 50” x 60” in size, has the AANP logo etched on one corner, and comes in a zippered vinyl bag. Proudly display your certification in this beautiful cherry finish hardwood frame. The frame has a stair-step profile that fades to black on the outer edge with an inner frame of a navy mat board and bright finished gold. Also featuring a gold plaque with the AANP logo on the bottom of the frame.